Some little girls dream of being a princess when they grow up. I just so happen to have given birth to a Princess. My friend owns a company that provides characters for parties. He had a party for a little girl who is sick with a immune disorder and couldn't have a traditional party for fear of becoming sick. Thankfully Abbey has recovered from the plague she had. 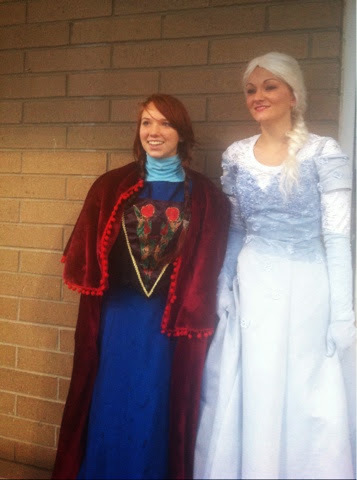 The little girl wanted Elsa and Anna (Frozen) to come to her party. Abbey got to be Anna. She didn't even need to wear a wig. Just a few hours earlier she was being a hateful teenager and driving me crazy. Seriously we stormed out of the mall, because I wasn't about to take one more second of a pissy attitude. 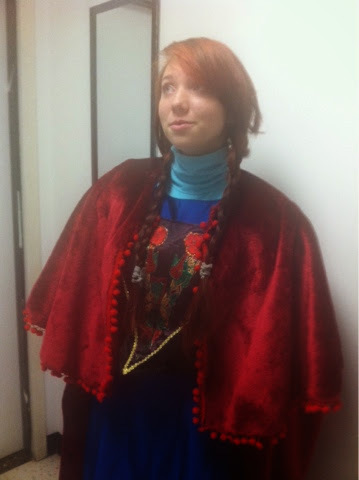 But when it was time to be Anna, she was a princess. 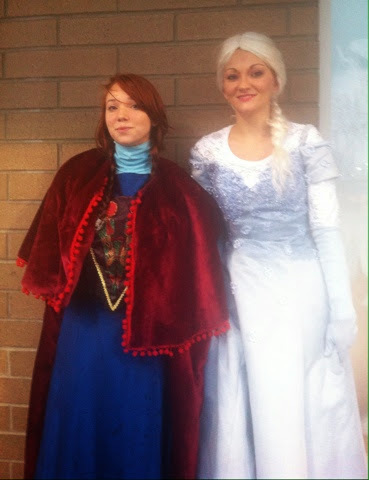 She was sweet and nice and made the little girl have a birthday she will never forget. Her eyes were sparkly and she was bubbly and happy after the party. She told us all about the girl and how the girl wanted to show Abbey/Anna her princess bedroom and play games with her. When the girl asked her where Olaf was Abbey/Anna told her that Olaf wasn't feeling well so he stayed home. I still haven't watched the movie but I am proud that Abbey was willing to take time out of her drama filled teenage angst having life to put a smile on someones face. While in the spirit of helping others, the girls decided to do a shoe box for operation Christmas Child. They chose to do 3 boxes to cover all the age groups. It was fun watching them pick out items that they thought a little kid would want. I paid the 7 online to get a special bar code so we can track our boxes and see where they are going. My plan is to use it as a geography lesson and learn about the country the boxes have gone to. Seriously overlook the phone pics. It was pouring the rain and my lens kept fogging over....or my phone is crap and I need a new one.... or both. Ha, that's awesome! She especially looks spot on. It's always nice when a teenager can stop their overflow of raging hormones, if only for an afternoon, for a good cause. That is so nice of her! She looks fantastic. It totally went to her head too. I really hope the hormones get under control soon. I can't handle much more attitude. What a doll! That's so wonderful that she was able to brighten a little girl's day. And that Operation Christmas Child project is so great. I think I should participate. We are going to make a tradition out of it. It felt so good to drop the boxes off, they were so appreciative and asked if we would like to help stuff shoe boxes next year. Building a box online is an option and they need people to actually put them together. I agreed. Its really the perfect job for such a drama queen.